We’re still a ways off from our prediction that every mobile app will have location integration. But we’re seeing that potential reality take shape more and more, especially as location-as-a-service providers create the tools necessary for developers to weave location into their apps. This past week has included a number of announcements that drive home how location will become widespread in applications beyond apps that are specifically location-based. At Mobile World Congress (MWC), Location Labs today announced the availability of its geofencing platform, opening it to all developers who want to build geofencing into their apps. Developers can now register for a free developer account and look at Location Lab’s geofencing APIs. Location Labs is also building a cloud-based service called Spatial Storage, which allows developers to integrate third-party location data from Maponics. On Monday, Xtify, a location-based marketing company, released its Smart Notifications Platform, an online tool that allows customers to push notifications simultaneously on iPhone (s aapl), Android (s goog) and Blackberry (s rimm) smartphones. 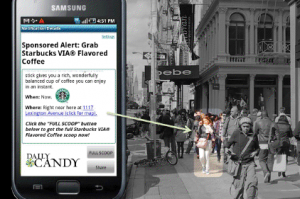 The notification can be triggered by location, time, past user behavior and other criteria. Skyhook announced this week that it had signed a licensing deal with Intel to make its Core Engine hybrid location platform available to Intel App developers (s intc) for the Intel AppUp center. That means developers will be able to tap Skyhook’s location technology for their apps for Windows and upcoming MeeGo based products. Last week, Loc-Aid said in its $13 million funding announcement that it has signed up AT&T (s t) , Verizon Wireless (s vz), Sprint (s s) and T-Mobile in the last year and is the only location-based service aggregator integrated in all four carriers. The company allows developers to tap into all of the major carriers network-based location data through one API. That’s helpful for targeting not only smartphones, but also feature phones, especially devices without GPS. Now this is just a look at some recent announcements, and some are limited in scope. But it suggests that the tools are falling into place for developers to more easily build robust location into their apps. We’ve seen a lot of location-based apps like Foursquare and mobile shopping apps, but there’s no reason why location can’t be a feature on even more apps. “Location is very hot, but location-as-a-service is even hotter,” Loc-Aid CEO Rip Gerber told me. Consumers may be less familiar with check-in services, but they’re increasingly comfortable with location services. A recent Microsoft (s msft) survey found that half of those surveyed had used a location service, though that includes GPS navigation. App makers are taking note. A survey last month of developers by Appcelerator and IDC found that location (78 percent) is the second most popular feature that app developers intended to include in their upcoming apps. The question is how will they choose to implement it? Many are utilizing GPS, but as location becomes even more important, many developers and brands are looking to augment GPS with other options. Skyhook has been aggressive in courting developers with its hybrid Wi-Fi, GPS and cell-tower technology and announced that it has signed up Citysearch, who will use Skyhook technology on its Android apps. But there are plenty of other players including platform makers Google and Apple, who are also pursuing their own location technology. What it all means is that the location-as-a-service market is poised to boom as more and developers and companies see location as a standard feature. Isn’t the location stuff the first thing that most people switch off ? I only ever switch it on if I am using a mapping application. Look at places in Facebook. I would say that less than 10% of people on my friends list use it and most of them are in the USA. Location is most valuable when integrated w/social connections. For most apps, only Facebook matters here.